The Prairie Star area rug in Peridot from the Signature Collection makes a wonderful new addition to any home with its unique use of colors and detailed design. This rug is perfect for a home of any style because it has an inspired native appeal which can easily fit into a modern home with contemporary decor or used to create a traditional aesthetic. There is fantastic detail, beautiful coloring and a relaxing sense of comfort that exudes from this rug. The best part is that it is extremely durable and has an amazingly soft nylon texture so you will love everything that this rug has to offer. 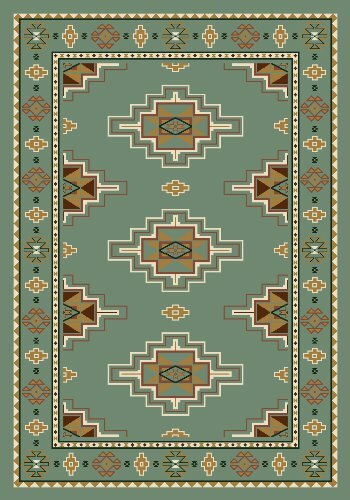 The Prairie Star runner rug in Peridot from the Signature Collection makes a wonderful new addition to any home with its unique use of colors and detailed design. This rug is perfect for a home of any style because it has an inspired native appeal which can easily fit into a modern home with contemporary decor or used to create a traditional aesthetic. There is fantastic detail, beautiful coloring and a relaxing sense of comfort that exudes from this rug. The best part is that it is extremely durable and has an amazingly soft nylon texture so you will love everything that this rug has to offer. Milliken Signature Prairie Star Peridot Rug Rug Size: Square 7'7"
4886C/6000-297 Rug Size: Square 7'7" -Distressed: No. -Technique: Tufted. -Type of Backing: Latex backing. -Material: 100% Nylon. Milliken Signature Prairie Star Peridot Rug Oval 3'10" x 5'4"
4886C/6000-293 Rug Size: Oval 3'10" x 5'4" -Distressed: No. -Technique: Tufted. -Type of Backing: Latex backing. -Material: 100% Nylon. The Prairie Star square rug in Peridot from the Signature Collection makes a wonderful new addition to any home with its unique use of colors and detailed design. This rug is perfect for a home of any style because it has an inspired native appeal which can easily fit into a modern home with contemporary decor or used to create a traditional aesthetic. There is fantastic detail, beautiful coloring and a relaxing sense of comfort that exudes from this rug. The best part is that it is extremely durable and has an amazingly soft nylon texture so you will love everything that this rug has to offer. The Prairie Star round rug in Peridot from the Signature Collection makes a wonderful new addition to any home with its unique use of colors and detailed design. This rug is perfect for a home of any style because it has an inspired native appeal which can easily fit into a modern home with contemporary decor or used to create a traditional aesthetic. There is fantastic detail, beautiful coloring and a relaxing sense of comfort that exudes from this rug. The best part is that it is extremely durable and has an amazingly soft nylon texture so you will love everything that this rug has to offer. Shopping Results for "Milliken Peridot Prairie Star"